Rock out your summer with DUCT TAPE Earrings! Summer is well underway and it’s HOT! So don’t throw those plastic cups away -turn them into rock star earrings. It’s easy with a little duct tape and puffy paint, I show you how to make these rockin earrings! Grab your kids and have fun making summer time crafts! A few years ago, a dear friend, Liz Welch gave me a very special gift – two copper tiles from the rooftop of her home in Nottingham England. They were beautifully patina’d by mother nature herself. 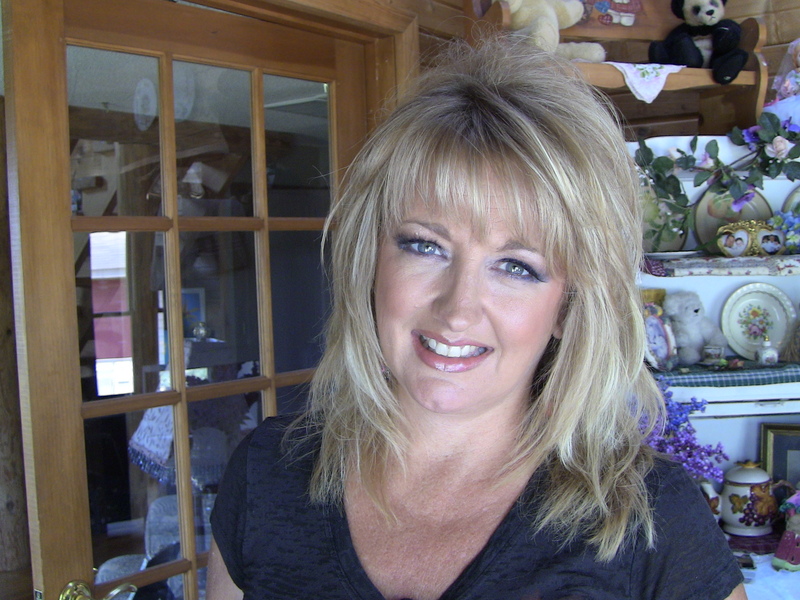 I treasured these tiles and have made several pieces of jewelry from them, including the earrings in this video. 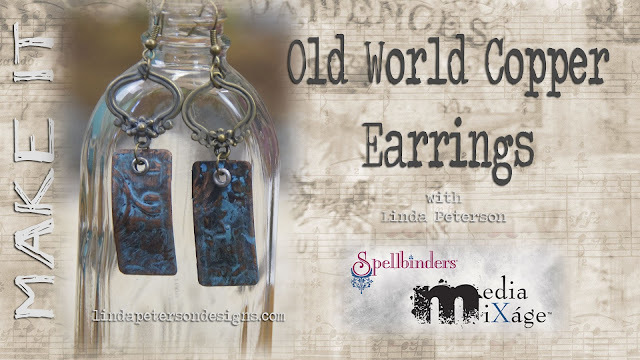 These earrings are among my favorite styles to make, because they are easy to make and by accessorizing with different charms you can make a lot of copper earrings in no time. I love how the Spellbinders® Media Mixáge™ line makes it so easy to mix and match shapes and textures so that the possibilities are really endless!. Use in a well ventilated area according to the precautions on the ammonia packaging. Prepare patina solution using 1 part water to 2 part ammonia. Add kosher salt to mix. Lay metal onto a rising form to lift above the solution. Cover tightly. The fumes from the ammonia will create a blue patina. Check back often. Remove and rinse when desired effect is achieved. Blot dry. Place copper sheet inside M-bossabilities folder. Sandwich between base plate and raspberry plate. Pass through the Artisan X-plorer™ machine. Cut two rectangles from copper using the #2 rectangle (with #1 being the smallest) in the Rectangles One template collection . Punch a hole in the center top of rectangle. Insert eyelet and hammer to secure. Repeat the previous 2 steps for remaining rectangle. Attach earring wire to link with jump ring. Slightly bend the rectangle backwards to give it a natural looking arch. In today’s Cool2Craft Live segment I share a great Autumn project – Autumn Drop earrings from my latest book BEADING IN NO TIME. I know it’s hard to believe that fall is just around the corner, but personally….this summer has been brutally hot and I welcome Fall and cool weather and snuggin up to the fire in my comfy clothes and candle light dinners and bringing out my fall sweaters and going shopping…and craft shows…and so much more. 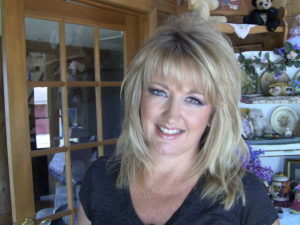 So, if you are looking for a quick and easy project – join me today at 11am eastern for the show. 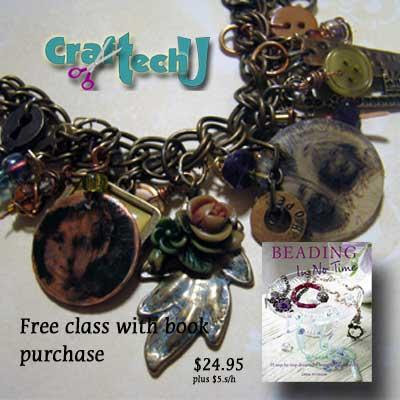 As a special thanks to all my viewers and those of you who subscribe to my blog, I’m offering this one time special offer…..
Get a signed copy of my book and a FREE class…yes that is right a FREE vintage charm class from CrafTECH University with the purchase. This class is the vintage charm class. It’s one of those projects that is a memory maker and one of those that you can just keep adding to – This class is live and online. 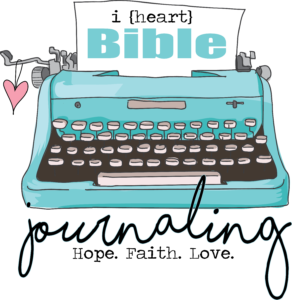 Now…here’s the cool part…”if” you want to purchase the book but the class time doesnt fit into your schedule…no problem! It’s recorded and available when you are…even if that means at 3am because you’re feelin a little crafty and can’t sleep. This is a $45 value for $24.95 (USA and Canada only). International orders please add $14 for priority international mail.